Our yellow and purple glass Jellyfish Paperweights are individually hand made by talented glass artists and amazingly glow in the dark. With their filamentous dangling yellow with purple flecked tentacles and bubble bell shaped heads these beautiful glass jellyfish are colorful realistic artistic representations of real life jellys. 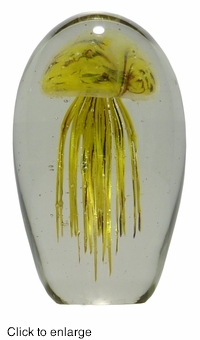 These hand blown gorgeous glass jellyfish are truly magnificent from every angle. The clear glass that encases the jellyfish makes them seem to float in the air, you will be easily be able to imagine your pet jelly floating happily in the currents of the open ocean. Our blown glass 6 inch jellyfish measures approximately 6 inches high and 4 inches in diameter and weighs in around 3.5 pounds. The yellow and purple jellyfish are handmade so sizes and colors will vary slightly. This groovy yellow/purple blown glass gem is a perfect complement to any collection and can be used functionally for anything from a paperweight to whatever you may imagine. For extra bright glowing in the dark, place the jellyfish near a bright light source for a few minutes or under a black light.